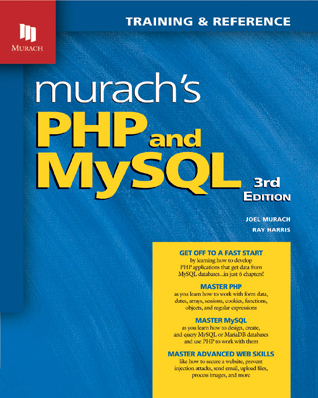 When I started working with PHP, I was hoping Murach would release a PHP book. I am thrilled with this book…. It is an excellent learning book, as it walks through all features, but it also is an excellent reference book. I highly recommend it for PHP and MySQL programming." This book gets your students started with PHP and MySQL (or its drop-in replacement, MariaDB) as quickly as possible and then builds out their skills in a professional way. To present the whole array of PHP and MySQL skills in a manageable progression, this book is divided into four sections. These are the skills needed to ensure that web applications come across as trustworthy, reliable, and fully professional. Then, the last chapter in this section shows how to put everything together in an e-commerce web site. To edit PHP code, you can have your students use any text editor you choose. However, we recommend using an IDE (Integrated Development Environment) such as NetBeans, like the professionals do. NetBeans includes a text editor that’s designed for working with HTML, CSS, and PHP. But beyond that, it provides features that make it easier for your students to run and debug their applications. That’s why chapter 1 presents a short introduction that shows how to use NetBeans for PHP development. Both include syntax coloring and auto-formatting to help your students develop applications more quickly and with fewer errors. In addition, like NetBeans, both are available for free and can be used for entering and editing HTML, CSS, and PHP code. To test any web application, including PHP and MySQL applications, your students need one or more web browsers. For that, we recommend Google Chrome, Mozilla Firefox, and Internet Explorer or Edge. To help your students install these products, the appendixes provide the web site addresses and procedures that they will need for Windows, Mac OS X, and Linux systems. "Murach’s unique style of putting explanations on each left page and corresponding examples on each right page is ingeniously simple yet amazingly effective. I frequently scan the sample page first and only read the explanation page when I need further clarification. However, the explanation page is always there if you need it. The result is a very fast read. Also, the editing is superb. So far, I haven’t encountered any errors in the sample source code. Excellent book." "Along with the great organization, ease of learning, and thorough coverage of the technologies and programming practice, this book is simply a pleasure to read. A solid 5-star rating all the way."